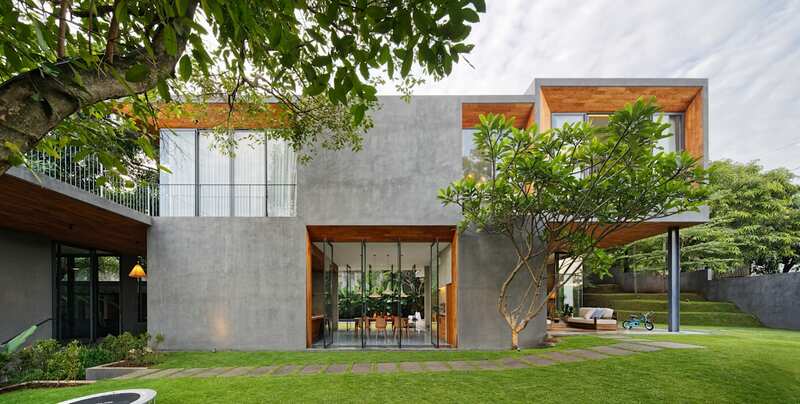 Located on a corner lot of a hilly neighborhood in the city of Semarang, Indonesia, the house opens up to its surrounding as much as it embodies a comfortable living spaces in the interior of the house. The house, consisting of grey masses that have wood lined openings, is arranged geometrically based on functions. One mass is the living quarter, one mass is office and garage, and the other is the service quarter. All these masses surround a void in which an existing mango tree has been growing since tens of years ago. This void then becomes the entry point of the house. The house focuses on creating sequence of experience that brings the focus back to nature through spatial overlapping of indoor rooms and outdoor rooms and presence of light coming through skylight and large openings. The house has tall and wide recessed openings throughout not only to maximize visual connection to its surrounding but also to let the house breaths by bringing protected light and air into the house. The articulation of the openings allows them to create an uninterrupted and boundless relationship between outside and inside of the house. The house uses contrasted but complementary materials of warm orange wood and cool grey concrete. These materials, kept in their raw conditions, create integrity and honesty to the architecture of the house through their unique natural characteristics.